In a world of constant war between humans and witches, there exist the “beastfallen”—cursed humans born with the appearance and strength of an animal. Their physical prowess and bestial nature cause them to be feared and shunned by both humans and witches. As a result, many beastfallen become sellswords, making their living through hunting witches.Despite the enmity between the races, a lighthearted witch named Zero enlists a beastfallen whom she refers to as “Mercenary” to act as her protector. 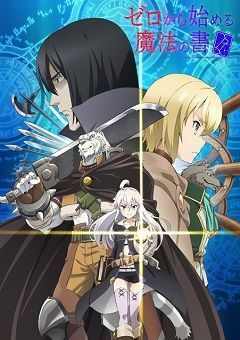 He travels with Zero and Albus, a young magician, on their search for the Grimoire of Zero: a powerful spell book that could be extremely dangerous in the wrong hands. During their journey, his inner kindness is revealed as he starts to show compassion and sympathy towards humans and witches alike, and the unlikely companions grow together.